This motor shield allows Arduino to drive two channel DC motors. 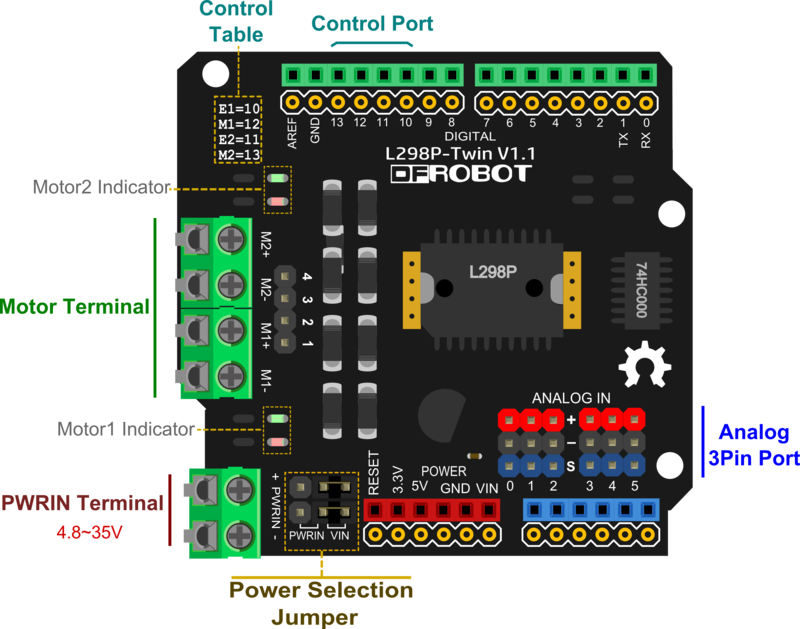 It uses a L298N chip which deliveries output current up to 2A each channel. 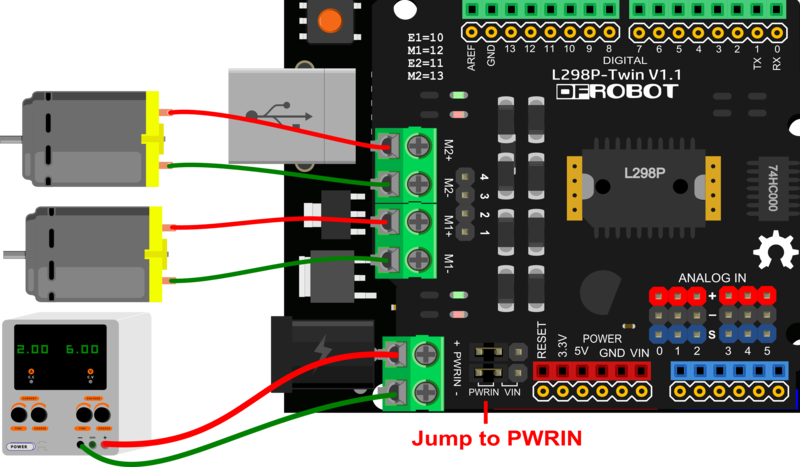 Power Selection Jumper: The motors can be powered by external power supply(PWMIN) or VIN from Arduino control board(e.g., UNO). Default is VIN showed by the diagram. Note: There are two jumpers in parallel that can afford heavy current. PWMIN Terminal: Used to connect to external power. Motor Terminal: Used to connect motors by screw terminals(M1- M1+ M2- M2+) or PIN headers(1 2 3 4). Analog 3Pin Port: Used to connect sensors or actuators. Note: pinout is (+ - S). Motor Indicator: The red LED lights if Mn+ is positive, whereas the green LED lights. Control Port: Used to control speed and direction of motor. You can get port's description in the "Control Table" printed on the shield. M1 will forward at full speed, and then half speed inversion; M2 velocity from fast to slow, reverse first, and then forward. 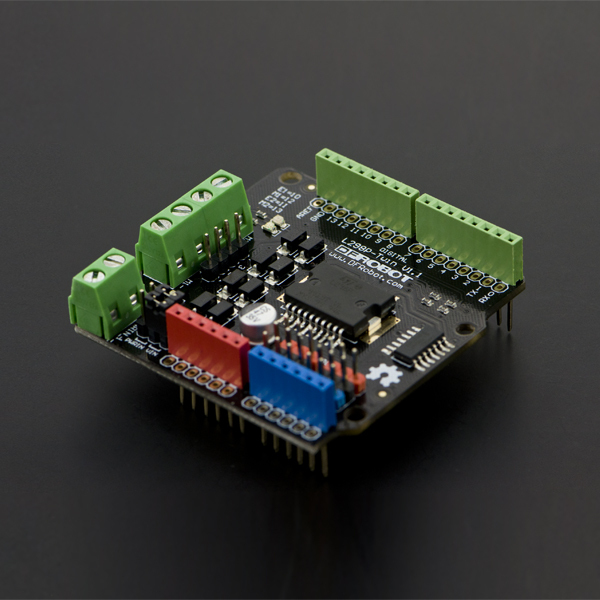 Get 2x2A Motor Shield For Arduino Twin from DFRobot Store or DFRobot Distributor.